We’ll begin with one of the more minor issues: the name. The idiom “a rose by any other name would smell as sweet” is one we use whenever we want to point out how fallacious it is to focus on names over what something really is, but sometimes, the name does matter. Within our hobby, NBA Elite stands as a good example. 2K has a much better reputation, but growing dissatisfaction with the brand and a few of its practices made its presence in NBA Playgrounds off-putting to some gamers. Not unlike NBA Elite, it’s also an awkward title. 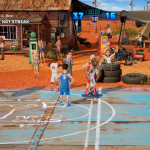 NBA 2K Playgrounds 2 doesn’t have as good of a flow as, say, NBA Playgrounds 2K19. For a first impression, it matters. Still, it is just a name at the end of the day and a lot of gamers do have very positive feelings about the 2K brand, so it also works in its favour. The strength of said brand has already paid dividends, as Playgrounds 2 includes several players that couldn’t be licensed for the original game. Michael Jordan and Kobe Bryant are the two biggest names on that list and a lot of gamers were clamouring to see them added in the first Playgrounds, so including them was a boon to both gameplay and marketability. 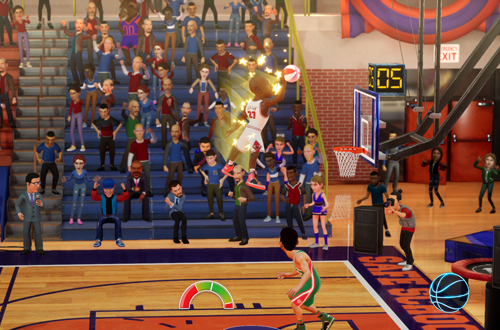 Even if EA Sports were to resurrect NBA Jam with an updated On Fire Edition, the superior gameplay and nostalgic moniker may not be enough to outshine their absence. An increase in resources has allowed Saber to invest in a better experience. While I’m not a fan of certain gameplay mechanics and believe Playgrounds 2 should’ve taken some bigger steps forward in its on-court experience, the move from peer-to-peer to dedicated servers for online play is a massive improvement. It allows the game to be taken more seriously, and played more competitively online. Features such as daily challenges are no doubt inspired by similar content in NBA 2K, which has proven to be very effective in getting gamers to jump on regularly. With all the great things that NBA 2K has done, Playgrounds surely benefits from any input from their developers. Of course, the 2K influence isn’t wholly positive, in particular when it comes to their business practices. Microtransactions have become an increasingly bigger problem in NBA 2K, and when the partnership with Saber was announced, they were fears that we could see a similar approach in Playgrounds 2. Unfortunately, we were right to be concerned. 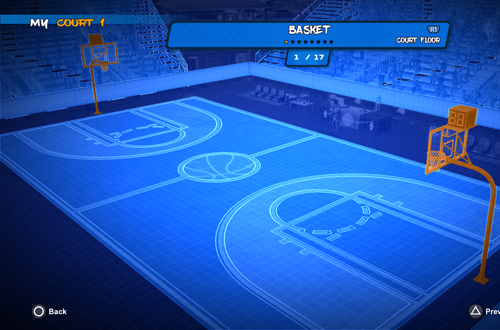 Playgrounds 2 introduced Baller Bucks, earned in-game and used to buy packs that unlock players, and Golden Bucks, a premium currency that can be bought similar to VC. Golden Bucks can be earned in-game as well, but at a much slower rate than Baller Bucks; an approach that, needless to say, encourages microtransactions. This isn’t a huge problem on the surface. Although it would take a while, it is possible to unlock all players with Baller Bucks. Indeed, Baller Bucks can be used to manually unlock specific players rather than trying your luck with a pack, which is a good idea. It’s only the “vanity items” – cosmetic items for dressing up players – that come in the packs purchased with Golden Bucks. It’s an aspect of the game that many of us can probably just ignore. However, there’s the matter of post-release content that comes in Golden Bucks packs: the All-Star jerseys and items for the new court editor. It’s luck of the draw with the packs, so you may end up spending to get what you want. An approach like that has 2K written all over it, and it’s disappointing given that the first game avoided it. Although the paid DLC to unlock all players was met with some resistance – and Saber CEO Matthew Karch mentioned that he wasn’t a big fan of the mechanic in an interview with Game Informer – gamers themselves had requested it. Also, while many new players and tournaments were added free, others came via the Hot ‘n Frosty paid DLC. As such, paying for new content in Playgrounds isn’t an idea that started with the 2K partnership, but the more aggressive approach that’s intended to generate “recurrent revenue” is reminiscent of what’s happened in NBA 2K. There’s even the same plausible deniability. You don’t have to spend money on the game. All of the players can be unlocked without doing so, and can also only be upgraded through gameplay. Again, only the cosmetic items come in the packs that are purchased with the premium currency, which you can also grind for. If you do want to speed things up, the options aren’t consumer-friendly. It costs 5000 Golden Bucks to unlock all players, but they can only be purchased in lots of 3000, 7500, and 16,000. When your new court editor is largely useless due to content being behind a paywall, and pay-to-unlock rosters potentially upsets online balance, it’s an issue. In short, the partnership between Saber Interactive and 2K has yielded the benefits that we hoped for, but also resulted in the problematic approach that we feared. We have some great new content and a game that is an improvement on its predecessor, but recurrent revenue-driven mechanics that are lacking in goodwill. It’s a shame because not only is the game quite solid, but what they’re doing with their support of the Safe Schools for Alex initiative is fantastic. The lack of goodwill with the way Golden Bucks are implemented does sadly take some of the shine off what is a solid game using its platform to be a force for good, and that’s extremely unfortunate. With all that being said, if a premium currency is going to be part of the game, then restricting it to cosmetic items is the best compromise. I know that it’s a problem in and of itself – the “it’s only cosmetic!” argument has a lot of holes – but it’s better than MyTEAM’s packs or MyCAREER’s attribute upgrades and gear, as the core content is far more readily accessible. There’s also the issue of the original NBA Playgrounds being pulled from digital marketplaces, which is unfortunate for those who didn’t pick it up before now. In all fairness, it may well be an issue with licensing rather than a power play on 2K’s part, but it’s still disappointing to lose it so soon after its release. 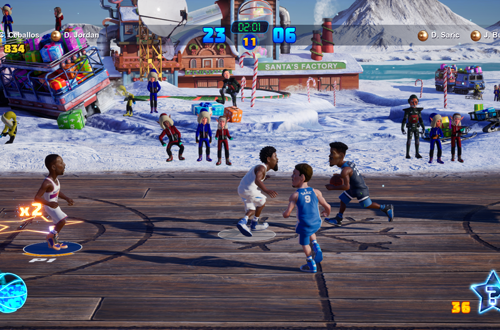 NBA 2K Playgrounds 2 has ultimately benefited from being brought under the 2K umbrella, and we gamers have reaped some of those benefits, but it’s also led to a few questionable moves. It’s also still not on par with any of the NBA Jam or NBA Street games, due to shying away from certain staples of the genre that have come to define it. As with the first Playgrounds, it’s tried to do its own thing and put a new spin on the traditional arcade basketball experience with mixed results, but it’s still fun. The approach to Golden Bucks is a drawback though, and for all the new Legends and features, moves like that are what really put the 2K in NBA 2K Playgrounds 2.